MVVM is a variant of the Model/View/Controller(MVC) design pattern that helps to achieve a clean separation of your application’s data and logic from its presentation. MVVM stands for Model, View, and ViewModel. The ViewModel is an abstraction of the View’s state and behavior, making the ViewModel completely independent of the presentation in View so the two can be implemented in parallel and boost productivity. Adopting the MVVM pattern is now a growing trend for large scale development. But because it is a newer concept, many users experience a difficult transition from MVC to MVVM but fall in love with it once they fully understand how it works. ZK is the first Java framework to incorporate MVVM as its fundamental development pattern. If you have not experienced how MVVM can accelerate your development efforts, let our experts guide you through the implementation of the MVVM pattern; from the basics to advanced topics in a 6-hour instructor-led Webex course. In addition, a special ZK 8 walk through will be included at the end of the session to help you hit the ground running. 1. A special annex “What’s New in ZK 8” walkthrough will be included at the end of the session guiding you with the latest innovations about ZK 8. 2. 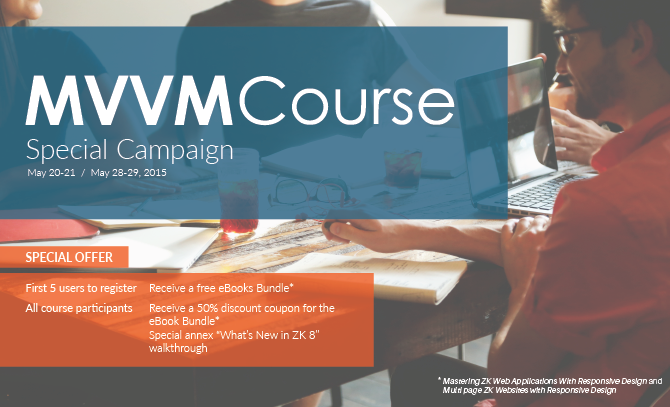 First 5 users who complete ordering MVVM course: Get free eBooks bundle “Mastering ZK Web Applications With Responsive Design” and “Multi page ZK Websites with Responsive Design” written by Top contributor Stephan Gerth along with a ‘websocket realtime admin dashboard module’. Completion order depends on the PayPal transaction time stamp. If you are interested in participating MVVM training or other training courses, please contact us at info@zkoss.org and we will get back in touch for further arrangements.